BYD Motors, an American Manufacturer of battery-electric transit buses, will roll out the world’s largest battery electric vehicle – a 60-foot articulated bus – in Long Beach, California on December 3, 2014. The vehicle can carry 120 passengers and will be driven from BYD’s factory in Lancaster, California where it was designed and built to Long Beach for a tour around town, and end with a reception showcasing BYD’s ZERO-emissions, all-electric cars and buses. This all-electric bus can travel more than 170 miles on a single charge (complete in 2 to 3 hours over-night). BYD is set to deliver the first five of LA METRO’s twenty-five 40-foot, 100% Battery Electric transit buses in early January 2015. “METRO is proving that they are one of the nation’s leaders in clean public transportation,” stated BYD America Vice President Micheal Austin. 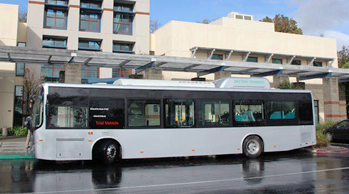 In addition, BYD has also deployed 13 of their 40-foot electric buses for Stanford University’s campus shuttle routes.